I am still rather amazed that my artwork emerged and improved during my breast cancer treatment. I never would have imagined such a thing happening. I loved drawing when I was younger, but it seemed that life’s way of becoming so busy took away any time or desire to draw. I began another drawing, one that I have named Running With Wolves, the day before I was supposed to have a mastectomy. I had to make some decisions about surgery after my chemotherapy treatments ended. I originally wanted the least amount of surgery possible, and was going to have a lumpectomy, where they only remove whatever is left of the tumor, and a bit of surrounding tissue. I could have had a mastectomy before chemotherapy, but I wasn’t able to imagine such drastic surgery at the time of my diagnosis. So my doctors opted for the least invasive approach and had me do chemotherapy to shrink the tumor first. 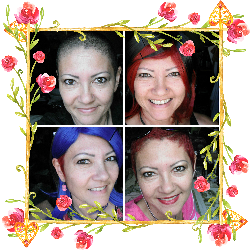 But after the chemo, I thought about it some more and ended up changing my mind. One friend told me, “You may as well get yourself a nice ‘rack’ after going through the pain of all that treatment.” She had a point. I decided on a bilateral mastectomy, removing both breasts completely. And, I was going to get immediate breast reconstruction, in which breast implant expanders are placed into the breast area at the same time as the mastectomy. This type of surgery takes about six hours and requires that the surgeon doing the mastectomy and the plastic surgeon placing the expanders being scheduled to be there at the same time, or, one right after the other. Because of the scheduling involved, I had to wait several weeks for the surgery date. And while I waited, I chose to have peace about it. I chose peace with all my might! I spoke success for the surgery. I wrote success for the surgery. I got in the mindset of being ready for the surgery. THEN, the day before the surgery was scheduled, everything changed! I went to Walmart to pick up some pillows to prop me up in bed after the surgery, and a few other things. While I was there, I got a phone call from my surgeon to let me know that the plastic surgeon had to go on an emergency leave of absence, so we had to make a decision of whether to proceed with just the mastectomy and have delayed breast reconstruction, or reschedule the mastectomy with immediate reconstruction. I had to talk with him a bit about this, because the only option I knew about was the immediate reconstruction. I tried to do research on my own, but honestly, chemo does things to your brain and I was not in the mental shape to be doing this kind of research. So, we decided to cancel the surgery, and they gave me an appointment the following week with a different plastic surgeon so I could get all the information I would need. After Walmart, I took my daughter to Hot Topic to get something for her. While I was there, I saw a t-shirt that really spoke to me. 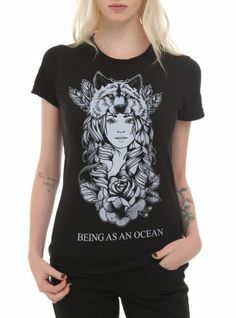 It was a t-shirt for a band I had never heard of, called Being As An Ocean, and the front of it had a drawing of a girl wearing a wolf headdress, with a rose below her face. I fell in love with it! I wanted to buy it, but I wasn’t sure about the band, and I didn’t know what kinds of songs they sing, whether their lyrics are positive or not, so I didn’t. Also, I have this problem of feeling guilty when I try to bless myself with something nice. (More on that in future blog posts.) I don’t beat myself up about it, but I do regret not getting that beautiful shirt. Then I got home, and felt SO LOST. UGH! I had to stop in my tracks. I was all ready to go with everything, then suddenly, the plans change. I had my life figured out for the next few weeks, and suddenly, I didn’t know what was going to happen or when. I had this surge of nervous energy from my life changing so drastically so quickly. 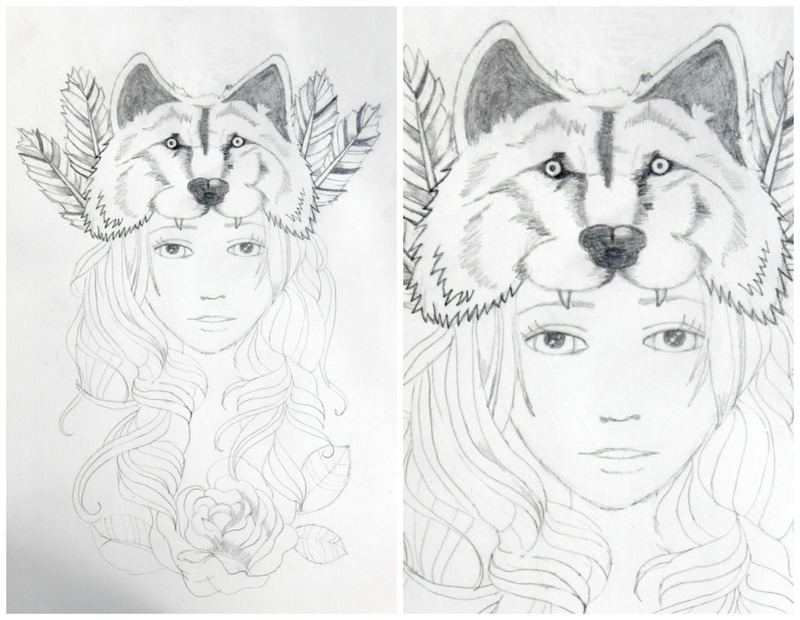 I found myself looking up online a picture of the t-shirt I saw, and I started drawing this beautiful girl with the wolf headdress and rose. I put my energy into this drawing that symbolized strength to me, and a fierceness that I was trying to embrace and connect with. It kept me occupied for several hours. And it was good. I haven’t finished it yet, but here it is. 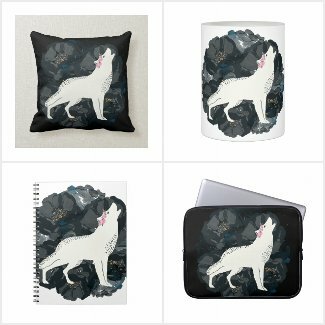 Interestingly, I had been inspired right at that time by a song by Aurora called Running With The Wolves. How appropriate. I was going to have to run with the wolves for several weeks, as I waited for the new plan to come together. Many nights, when I was feeling particularly frustrated or discouraged, I danced outside to this song with my flags. Me and God, under the stars and moon. It lifted my spirits, and filled me with feelings of being loved by God, and feelings of being filled with His strength. The next few weeks were TOUGH. I went through feelings of devastation many times. And many tears. But I had this song, and I had this picture I drew of a beautifully fierce girl that I could look at. And I saw myself as this fierce girl, with a beautiful fierce headdress, and I knew I would get through it, I knew I would be able to RUN. May you find your fierceness and strength to face your battles. May you know the strong person you can be, and may you be her. May you have a beautiful headdress representing strength, and may you also be beautiful. This post is Day 16 of my 31 Days of Breast Cancer Series. Click HERE to see Day 15. Click HERE to see the page of all 31 Days.